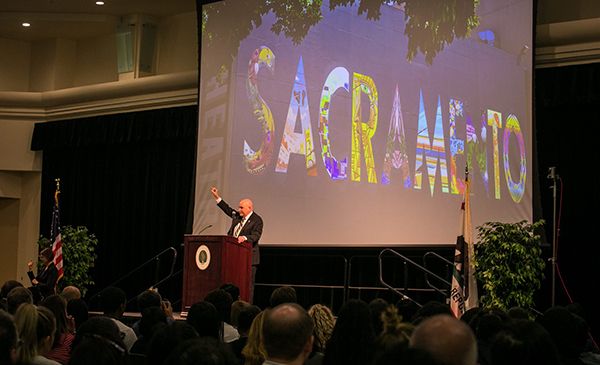 President Robert S. Nelsen declared Sacramento State “Sacramento’s anchor university” during his 2018 Fall Address to the campus community on Thursday, Aug. 23. “An anchor university is driven to improve the community in which it lives,” Nelsen told the standing-room-only crowd of more than 1,100 students, faculty, and staff gathered in the University Ballroom. “An anchor university wants to see true, lasting change through civic engagement,” he said. “It seeks solutions to poverty, hunger, inadequate education, unemployment, and health deficiencies. It overcomes the fragmentation of departments, colleges, divisions, and disciplines. Instead, it marshals all of the University’s knowledge and expertise and strives to solve real-world problems. An anchor university “is committed to community and place,” he said. The commitment is driven in part by Sacramento State Downtown, which has a grand opening set for Tuesday, Aug. 28. The Graduation Initiative – Sac State’s projected four-year graduation rate for 2018-19 is 14 percent, a notable increase from 8 percent a few years ago. And the projected two-year graduation rate for transfers has increased to 37.5 percent. “Our ‘Finish in Four’ and ‘Through in Two’ campaigns are working,” said Nelsen, who also noted that nearly 75 percent of first-year students are taking 15 or more credits, an improvement from 21 percent in 2010. Diversity, equity, and inclusion – Of the 58 tenure-track faculty hired for 2018-19, only 35 percent reported they are faculty of color. Nelsen noted that not all hires reported their ethnicity but said, nevertheless, the numbers are unacceptable. Philanthropy – Sac State last year raised $23.89 million, exceeding the goal of $15.5 million set for the campus by the California State University (CSU). Included was Ernest E. Tschannen’s $9 million donation for the new Science Complex, which will bear his name. Sac State must raise an additional $11 million to replenish borrowed reserves needed to build that state-of-the-art structure. Nelsen also alluded to an coming announcement of the University’s first gift of more than $10 million. Community engagement – “Even though community engagement is at the heart of who we are as a University,” Nelsen said, “it lacks purpose and focus. It is spread throughout the corpus of the University, but it is not coordinated. Safety – A chemical spill in a chemistry lab, high levels of lead found in Santa Clara Hall, and the discovery of elevated lead levels in campus drinking water prompted a safety audit by the state of California. Among those improvements are the 8-2020 hotline to report potential campus hazards to Risk Management, Quick Response Codes labels on all drinking fountains, and a new campus-wide policy to improve safety in labs and shops.